Resistance Spot Welding is a pressure welding process during which the sheets are pressed together locally with the help of fitted copper electrode welding guns. Resistance Spot Welding (often just called spot welding) is a cost-effective joining technology that continues to be very popular in the automotive industry where high reproducibility and automation are essential criteria. An additional advantage is that, with a suitable choice of parameters, a high quality of joints can be obtained without being dependent on a welder’s ability. Resistance Spot Welding is a pressure welding process. The sheets are pressed together locally with the help of fitted copper electrode welding guns that then have a current applied to them. As a result, Joule heating locally melts the joining partners at the junction resulting in a cohesive composite once the joint has solidified. For more than 150 years now, resistance spot welding has proven itself as the dominant technology when joining thin metal sheets. In particular, the automotive industry continues to use resistance spot welding as its main joining process, despite strong competition from the processes of beam welding, adhesive bonding and mechanical joining. The main reasons for this is that resistance spot welding offers high productivity at a low cost and is therefore, likely to maintain its position into the future. The use of control devices for quality assurance and a reduction in the resources needed to inspect parts and processes. The development of welding processes with a low energy input, computational welding simulations and an increase in training using a virtual welding trainers, have all contributed to making joining technologies as energy-efficient and material-friendly as possible. One way to preserve the welding expertise within a company and to reduce trial costs is to use a welding simulation software that offers both structure and process simulations. This allows the potential process parameters to be virtually and investigated with appropriate parameters being documented. In order to prove the general weldability of a structure, one has to consider and plan the weld reliability (design), weldability (choice of material), and welding feasibility (manufacturing). These domains interact with each other – particularly with regard to welding distortions. Welding distortions play economically together with reduced strength of a component - the most important role for a welding process design or of a welding assembly design. Unexpected welding distortions often cause expensive subsequent machining and straightening steps. Additionally, further effects might influence the quality of the final product. Depending on the choice of material, welding sequence and welding process, residual stresses can significantly reduce the strength of single joints or of the whole assembly. Furthermore, the material properties can change due to heating and cooling, also leading to undesirable effects (i.e. notching effects and stress concentration due to phase transformations). Compensation of such effects usually leads to more and thicker materials, making the assembly heavier and bigger and therefore more expensive, also influencing the joining process itself, i.e. leading to multilayer welding. Read more about the causes of welding distortions. The main goal of welding simulation is a prediction of welding distortions. That´s where Simufact Welding puts a focus on. Due to the implementation of material models, Simufact Welding can also calculate phase proportions, material conditions and resulting local material properties, as well as further effects like transformation induced plasticity and transformation strains. What support can Simufact Welding provide during the design of a welding process or of a welding assembly? Both applications can significantly reduce the experimental efforts allowing studies of different assemblies, clamping tools and fixtures as well as welding sequences before there has been time and money invested in prototypes, components and welding equipment. The above mentioned advantages of Simufact Welding also reduce the time-to-market of the final product while reducing development time and costs significantly. Another typical task for resistance spot welding is the quality assurance of individual joining points. A car usually contains between 4.000 - 5.500 weld points with between 200 to 400 different material thickness combinations. Process windows can be determined and approved regarding the weld gun power, current and process time (among other parameters) for each material thickness when combined with the corresponding coatings in a production process. 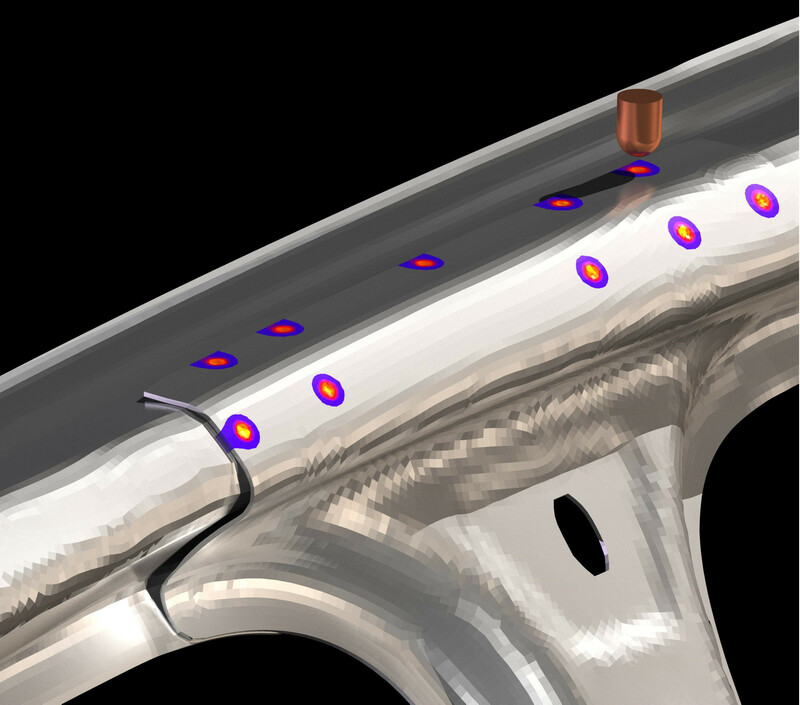 Other influences such as the radii of curvature for complex geometries and shunting effects can also be investigated with Simufact Welding.